It may or may not be what you want (you don’t have ads, so it seems unlikely that you care too much), just thought I’d let you know. Hate to say it I liked the old color this one is pea green. Wait, you mean we can’t let them fight to the death now? Aww… damn. Yeah. I’ll fix it this weekend. I really enjoy your strip. But that’s not a mace, it’s a morningstar. A crossbow bolt to the whine-hole sounds like a good way to handle a LOT of things! 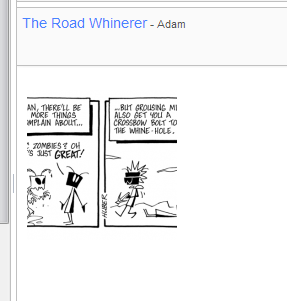 Hate to say it, but I think first panel should be “More or fewer whiners”, because you can count them. Not “less”. Well then don’t say it. Well, what do you think about an apocalypse after which the absolute number of people went up? So I, for instance, concluded that he didn’t mean the absolute numbers, but the percentage. But I’m not a native speaker either. I just won’t use “fewer” in a sentence where I mention that a percentage value went down. Grumble dome…lol I have a list I can lend you of the first contenders. Yeah, I was going to point out that it should be “fewer” whiners, but I was too afraid of receiving a crossbow bolt to my whine-hole. A great cartoon– text and art– and the comments… today’s strip is definitely a winner! Also not crazy about the pea-green and red combo, but maybe it’s temporary. Everything that looks different about the site is subject to change. O_O i go away for a few days and i come back to a new website. i like the changes makes the website look better. Another Road Warrior-inspired strip? Adam, as big a fan of your work as I am, can’t you get beyond Thunderdome? That one was a real mind-Turner. Oh please tell me you plan to start a whole week of Toxic Zombie comics eventually! I know they must have been hard to draw, but – just look at them!! Toxic Zombie Awesomepocalypse! I could go on, Adam. Lots of ideas…but I can’t draw worth a lick!